PC's Blog: HIDDEN launch party! Pc! Congrats! The first two chapter are sooooo good. There will be a trailer for Hidden? Please say you're coming to Sweden! No one I like ever comes here but it would be awesome if you did! I have one of your signed books though. But meeting you would be W O W! I wish I lived closer to Oklahoma. It is my dream to meet you and Kristin. Hopefully one day I will get to. I wish I could be there! So sweet! <3 But sadly I live in Tennessee. Ger - I didn't know chapter 2 was posted yet! And yes - there will be a super cool trailer for HIDDEN! Hanna - the European tour isn't totally set as yet. I'm not sure of anywhere except France and Germany. I'll post when I know more. Victoria - google Goodreads. It's easy to find/join. Blackcat - yep, just contact The Book Place and they'll fix you up! Oooooh, I can´t wait. And yes. Chapter two was posted yesterday. So sweet the change of Nicole and the love of Lenobia and her Martin/Travis. You´re the best writer, your books have te capacity of hold the attention. Sorry for my english. Only 26 days for HIDDEN. Hi, PC. I'm an italian reader. So, naturally, I wish met y'all, if you and Kristin will go in Italy. I'll see the next post about the tour. Greetings! I didn't know the second chapter was posted. It's very good too, congrats! As you say, "I heart me some Lenobia!". I'm so glad you're coming to France, so I'm watching carefully for the details of your tour! I'm so going. I live more-or-less 45 minutes away in Muskogee. Excited! Elfolletto - I love Italy and have visited several times. I'm looking forward to fitting in a tour to your lovely country in the next year or so. Do I have to call La Fnac in Paris for the organization of the event or will you give more practical info on your blog? Hopefully I can be there, It'd be awesome! Me and my best friend, we are big fans of HoN!We always talk about what we liked and what we're excited about! Please say that you are coming to London for your book tour!! Geraldine - I'm doing a couple events in Paris (details to come!). It would probably be a good idea to call the store to be sure you get in. Often on the European tours bookstores will issue tickets and limit attendance. Not sure how that will be in France, though. Keisha - sorry, I've made multiple trips to the UK, so this time I'm giving other countries their turn. I do heart me some London, though! Thanks a lot PC, I'm gonna call them so that I can organize my trip to Paris. I hope I'll have a ticket! The first two chapters are amazing!!! 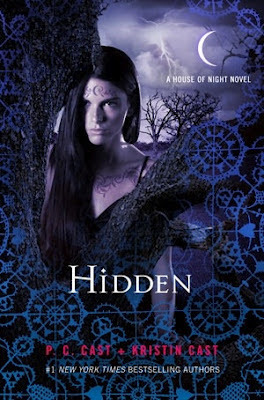 I can't believe Hidden comes out in three days!!!! You should come to Calgary (The one in Alberta Canada!) You are my idol!!! Im in love with the House of Night! I can't wait to get Hidden. I wish I lived closer to Oklahoma instead of Maine. It would be soooooo cool just to meet you and Kristin.